Wall Mount Sign Holder with Adhesive tape -Commercially Rated Sign Holders that stick well, keep signs safe from stains, scratches and cracks. - Well-suited for retailers, restaurants, trade shows, hospitals or to display your signs, certificates and pictures - No hardware to install. 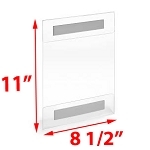 Simply insert sign and unseal adhesive double sided tape and attach to its mark. Made from a durable, clear acrylic material. 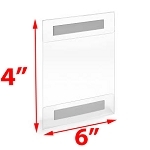 Also known as acrylic sign holder with tape, adhesive wall sign holder and wall mount poster frame with adhesive tape.